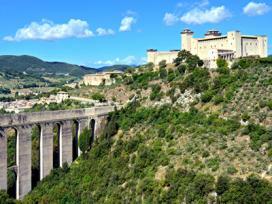 >> Do you want to visit Spoleto? Check it out now of the hotels in the vicinity. The Arch of Drusus (23 A.C.) to be found near the Romanic church of St. Ansano , the Roman theater, whose construction goes back to the first years of the Empire, and the paleocristian Basilica St. Salvatore of the 4th century (at about 1.2 km's distance to the north), are testimonials of Spoleto's earliest origins. Close by, the Church St. Gregorio Maggiore, (12th century), characterized by its evocative apsis zone and by the elevated presbitery, a Roman bridge (also called "the Bloody") consisting of three arches in travertine stone blocks and the amphitheater of the 2nd century A.C. can be found. More modern monuments which are as fascinating are the Churches of St. Dominic and St. Ponziano, both of which were built during the 12th century. The Church of St. Peter is surely of great interest because of its extraordinary bas-reliefs which decorate the facade which dates back to the 12th century. 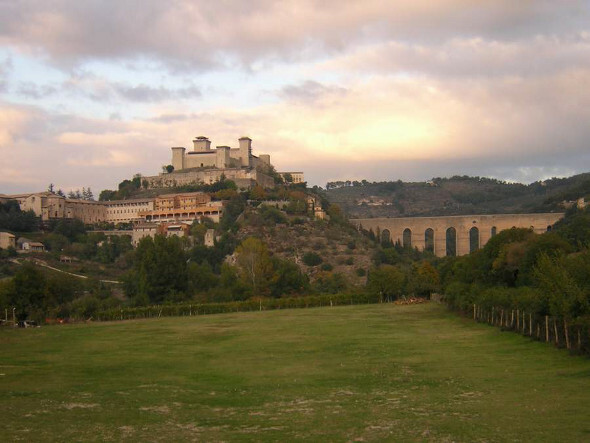 There are some last minute offers for vacation rentals and b&b in the area of Spoleto! Click and Consult them immediately. From the area found in front of the church of St. Peter one enjoys a wide panorama which encompasses all of Spoleto until the mighty Bridge of the Towers (ten arches with a total height of 80 meters and 230 meters long), which connects the Castle, which was constructed from 1352 onwards on the orders of the Cardinal Egidio Albornoz according to plans by Matteo Gattaponi, to the runners of the mountain which dominates the city. Monteluco was, in fact, the sacred mountain of the anchorites, who having settled in this zone from the 7th century on, founded the convent of St. Francesco, to be found at about 8 km's distance from the inhabited area, and the church of St. Julian. Without doubt, on the person who has the good luck of visiting these sights, the entire Cathedral complex constructed during the 12th century and caracterized apart from the richness of furnishings of the interior also by the mosaics in the Byzantine style on its facade, and the Romanic Church of St. Eufemia will make an unforgettable impression. Among the most important manifestations taking place in the city we should absolutely mention the Festival dei Due Mondi. >> If you've decided to visit Spoleto you should contact now farmhouses in its vicinity >> click this link.